This dynamic female vocal trio has been thrilling audiences nationwide for over 10 years with their stunning close harmonies, dazzling costumes and stylish choreography. As The Andrews Sisters Celebrity Look Alike-Lookalike Impersonator Tribute Artists they have garnered appearances on television’s “Gilmore Girls” and “Your Big Break”, they star in their original show. They present a Tribute to the USO”, and they frequently perform for major corporate and private events. 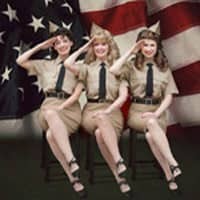 They perform music made popular by The Andrews Sisters and The McGuire Sisters, as well as a 1960’s Girl Group Review and a Tribute to Mamma Mia! Their countless featured appearances include:The Kennedy Center with The Los Angeles Police Department Concert Band; The Avi Casino in Laughlin, NV; The Thousand Oaks Civic Arts Center in Thousand Oaks, CA; The Secret City Festival Concert in Oak Ridge, TN; American Red Cross Annual Fund Raiser in Jackson, MS; HBO’s “Band of Brothers” Gala; Reunion of the All-American Girls Professional Baseball League with Director Penny Marshall and Cast of “A League of Their Own”; for Bob Hope’s 100th Birthday celebration; with Tom Dreesen to commemorate WWII Veterans; as featured Guest Artists with Harry James Orchestra in Seattle, Pasadena Pops Orchestra, and Long Beach Municipal Band Summer Concert Series; and numerous performances for USO and Patriotic theme shows for townships, military bases, and aboard the USS Midway in San Diego. Andrews Sisters Tribute, Andrews Sisters Impersonators.